What are the best toys for Pitbulls, and where can you find them? Let’s find out! Being a Pitbull owner today isn’t always an easy road. 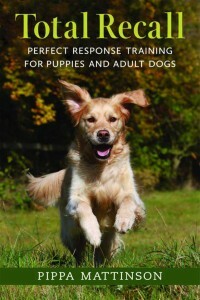 There are many myths circulating and much misinformation about these highly intelligent, driven, loyal and loving dogs! In fact, many people don’t even realize that the term “Pitbull” isn’t an actual dog breed at all! But more on that in a minute. It is true the Pitbull dog was bred to be tough. Breeders looked for genes that gave these dogs the determination, pain tolerance, strength and smarts to succeed in fights with (sadly) other dogs. In a strangely wonderful twist, it is these same traits which can make “bullies,” as their fans often affectionately call them, such amazing canine companions to people! Pitbulls can be rambunctious with their toys. “Boy, that toy lasted for two years and my bully never put a dent in it,” is something you will likely hear from no Pitbull owner, ever. The best toys for Pitbulls last. 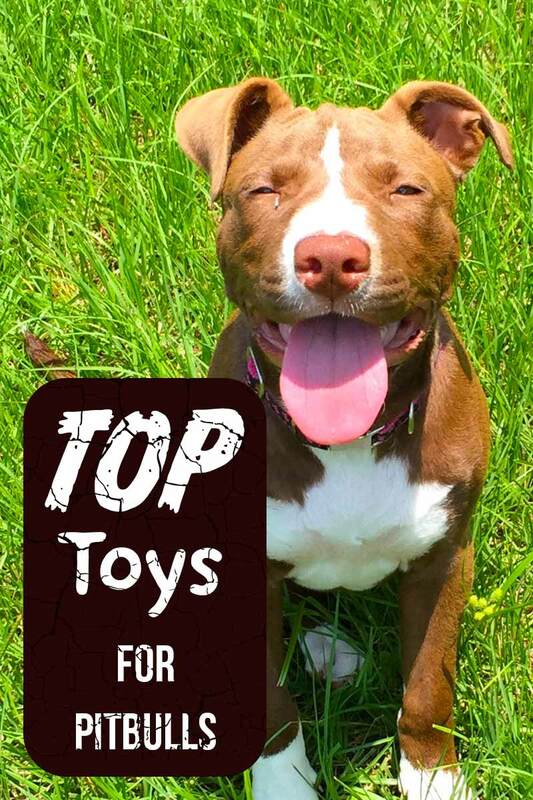 This carefully curated list will include the best dog toys for Pitbulls to chew, fetch and retrieve, tug on and play with. So without further ado, read on to find the best Pitbull toys for YOUR bully! If you are caring for your very first Pitbull (or buying Pitbull toys for a friend who has a bully) you may not yet know that the dog we casually call the “Pitbull” or the “pittie” may be any number of different dog breeds! But because of crossbreeding, often without any real intention of doing so (dogs will be dogs sometimes), there are many dogs today that have some amount of pit bull genes. Consequently, a dog can look like a true American Pit Bull Terrier but not actually be one! Breed specifics aside, the Pitbull dog breed is considered to have a high energy level. This dog is not a couch potato! Your bully will want to run, play, chew, tug, and perhaps even swim! The happiest Pitbull is an active Pitbull. And for this, the best toys for Pitbulls are a must! If there is one area where canine mythology abounds, it is in the delicate topic of Pitbull jaw strength! You may have read a lot or a little on this popular topic. At least one researcher states that all we really know is that the Pitbull has a strong jaw. We think that part of jaw strength has to do with the sheer size of the jaw. Here, a larger jaw theoretically equals a stronger bite. But then again, as any Dachshund owner knows, determination can often make up for a lot (just try getting a delicious treat away from a doxie who doesn’t want to give it to you!). The truth is, Pitbull jaw strength is very much in alignment with other large-breed dogs such as Rottweilers and Mastiffs. The difference is that when they grab on, they don’t let go. What does this mean when picking out the best dog toys for Pitbulls? You should definitely opt for really, really strong ones like the ones we list here. So your Pitbull has never met a toy he couldn’t dismantle. You are not alone! These dogs engage with their toys the same way they engage with life – full-on! Starting in the next section, you will find some awesome toys for Pitbulls that were built with your bully in mind. 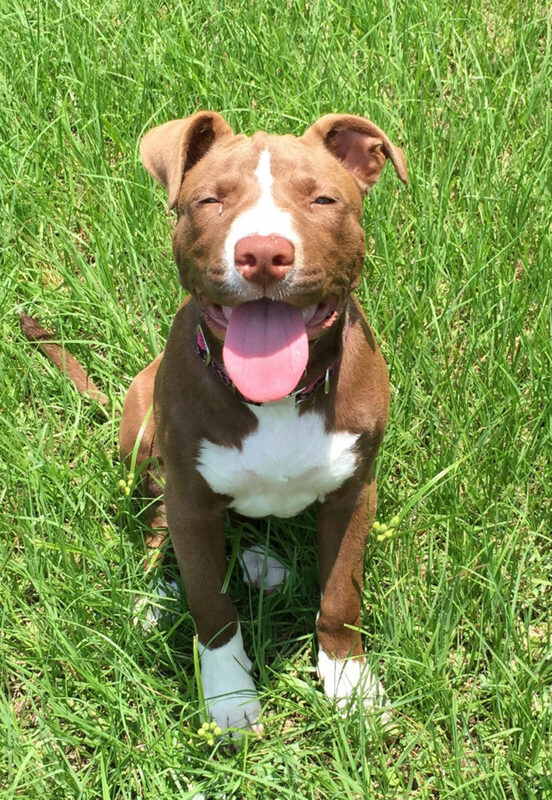 One Pitbull puppy safety tip that might come in handy: if you are running and playing with a Pitbull puppy, avoid runs for more than one mile until your pup is at least 12 months old and her growth plates have closed and solidified. Signs your Pitbull needs more play time can include chewing on things you don’t want her to chew on, increased whimpering or barking, soiling in the house, high levels of anxiety or hyper-activity and simple disobedience. In addition to dog toys for Pitbulls, these dogs are known to excel at agility training, obedience training, canine lure coursing sports, therapy and service dog training, and show training. Want a happy pittie? 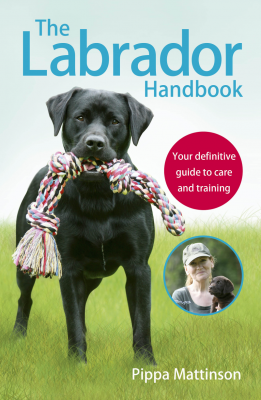 Give your dog a job to do and practice on every day! 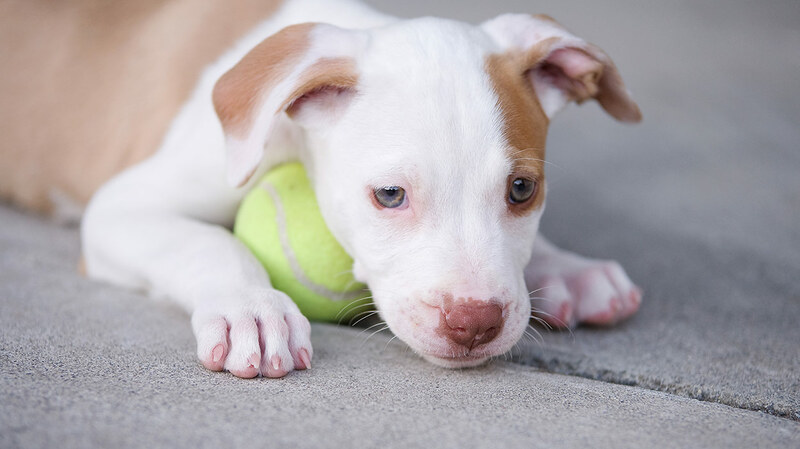 When you are selecting chew toys for Pitbulls, you might be thinking about easing your Pitbull puppy’s teething pains or giving your pittie something fun to play with. You may not think right away that the Pitbull chew toys you pick out could end up being a choking hazard! While this can be true of any toy once your pittie has chewed on it for a while (which is why it is so important to regularly cull heavily-chewed toys), smaller chew toys could potentially be swallowed whole, creating a life-threatening obstruction. Goughnuts Original Dog Chew Ring. Goughnuts makes a whole line of guaranteed indestructible chew toys for power chewers such as Pitbulls. In fact, the company guarantees that your dog won’t penetrate the outer layer of the toy – if he does, you get your money back! While it is hard to pick just one Goughnuts toy, this chew ring is one of the best. West Paw Zogoflex Tux Interactive Treat Dispensing Dog Chew Toy for Aggressive Chewers. When you want to give a treat-dispensing toy to a pittie, you’d better prepared for it to get chewed on….a lot! This toy is super tough and comes with a 100 percent manufacturer guarantee. It is chew-safe and made from BPA-free, phthalate-free, dishwasher-safe, recyclable materials. Unbreakoball Dog Toy. This bright orange robust ball comes in two sizes: 6-inch and 10-inch (called the “Big Daddy”). 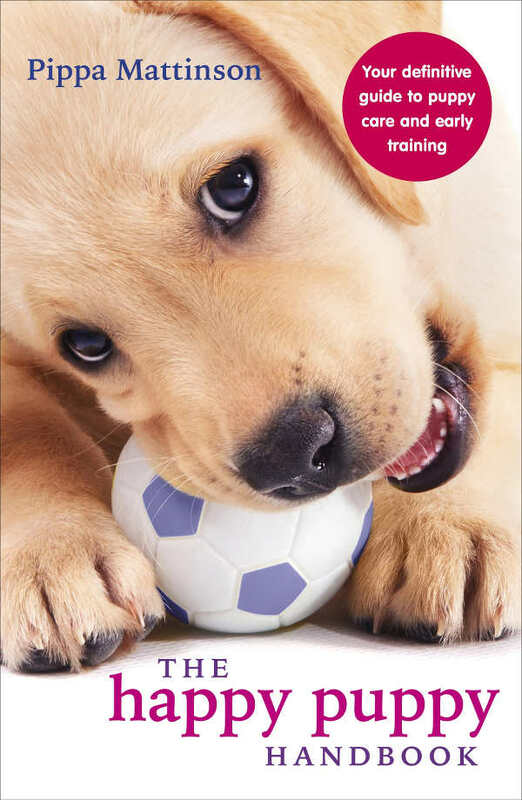 The ball features small round openings so your bully can get a tooth-hold to carry it around. It also floats! A pittie’s enthusiastic chewing is one issue to tackle when choosing Pitbull toys. Your pup’s equally enthusiastic tugging is quite another. These pitbull tug toys are sturdy and durable, made with high-quality materials in bright, intriguing colors your dog will love! Jolly Pets 8-inch Romp-n-Roll Ball. This super-sturdy ball is attached to an equally sturdy braided cord. The entire toy is made so that chewing, puncturing, tugging and other playtime activities won’t cause it to deflate or break apart. It comes in three sizes and three colors. West Paw Zogoflex Bumi Interactive Tug of War Durable Dog Play Toy. Bullies love a good game of tug-of-war, and this 100 percent guaranteed-tough toy is designed for full-on power play! This toy is totally safe and is free from BPA and phthalates. It is also dishwasher-safe (top rack only). It comes in two sizes and three colors. Mammoth TireBiter Chew Toy with Rope. Talk about a chew toy and a tug toy in one – this incredibly durable tire and rope toy is made from all-natural rubber and double ply nylon for a truly long-lasting and fun pitty toy! There are four sizes available. Pitbulls definitely love to chase toys and they really love to catch them. If the toy is interesting enough, though, you might run into trouble with the “bringing it back” part! Either way, these tough-as-nails dog toys for Pitbulls give your dog a multi-sensory experience, whether from treats, textures or colors. This bright orange extra-durable bone is also an interactive treat toy (the open center portion of the toy can be filled up with treats). You can use it for fetch, tug-of-war or just a lovely alternative to the traditional Kong for when you are leaving your pup home alone. Monster K9 Indestructible Dog Ball. This bright orange dog ball comes with its own lifetime guarantee – that is a big promise when you are delivering the ball to a pittie! The ball has been field tested with Mastiffs, GSDs, Pitbulls and similar breeds. The baseball-sized ball width is 2.5 inches (7 cm) so it will be much harder for this toy to turn into a swallowing risk. West Paw Zogoflex Zisc Tough Flying Disc Dog Play Toy. Every pup needs their own Frisbee, but this is no ordinary Frisbee! As one of the toughest dog toys for Pitbulls, this flying disc is great for fetching on land and in water and it won’t succumb to your pup’s chomp of joy when he fetches it. It comes in five colors and two sizes. 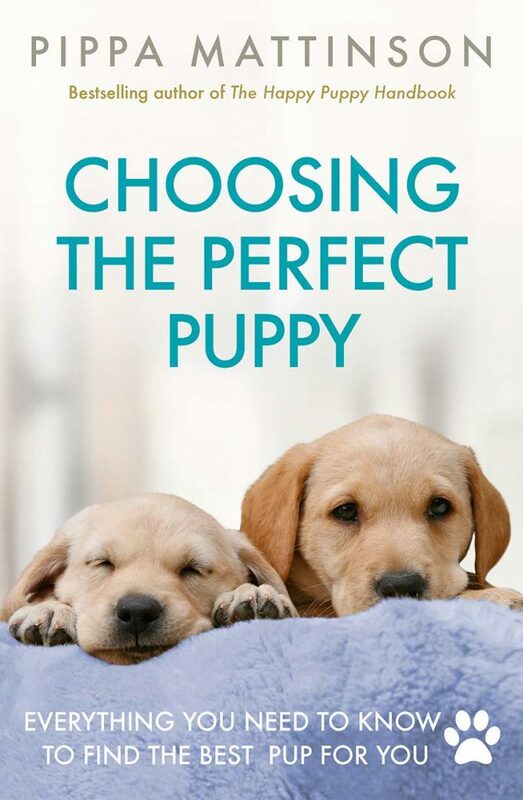 Finding the best toys for Pitbull puppies can be an exercise in frustration, since many teething puppies seem to think everything is their chew toy. Nylabone Dura Chew Textured Dog Chew, X-Large. Rated for pups 50 pounds and larger, these super-durable Pitbull-proof dog toys will keep your bully puppy chewing happily for hours. They come in multiple flavors. Mammoth Flossy Chews Cottonblend Color 3-Knot Rope Tug. You might want to buy the X-large 2-pack of these super-strong indestructible dog toys for pitbulls. Pitbull owners say these are fab for their pitties and they last 3-4 weeks before needing to be replaced. Benebone Real Flavor Wishbone Chew Toy. This super-strong chew toy is recommended by Pitbull owners for pittie puppies. There are three flavors and three sizes. This bone isn’t meant to be ingested but just chewed on. The flavor and scent comes from all-natural meat sources. Once you bring home a Pitbull dog, you may find you have also ventured out onto a never-ending quest for Pitbull-proof toys. Luckily, this is something certain toy brands have caught on to, and now you have plenty of choices for indestructible (or nearly so) chewing, tugging, tossing, fetching, bobbing and teething Pitbull toys. These indestructible Pitbull toys are heartily endorsed by Pitbull owners as being tough enough to out-tough their pitties! JW Pet Company Hol-ee Roller X Extreme 5 Dog Toy. As you are looking around for durable toys for Pitbulls, you can’t help but be delighted with this one – it is so robust and multi-purpose. You can use it as an interactive treat ball, tug-of-war toy, fetch toy or teething toy for a pittie puppy. Goughnuts Indestructible Dog Toy Maxx. When the brand says “indestructible Pitbull toys” right on the label, you know the toy has got to be tough! This toy also comes in a figure-eight ring version. Both float and are also great for teething pittie puppies and fun games of tug-of-war. OneisAll Bone Chew Toy – Indestructible for Aggressive Chewers. Again and again this green bone toy keeps being recommended by Pitbull owners, and clearly for good reason! Not only is it made of safe, non-toxic, bacon-flavored nylon materials, but it also helps to clean your dog’s teeth and reduce tartar during chewing sessions! There are three sizes. As you can see, the list of manufacturers who have created brands tough enough to withstand Pitbull chewing and playing is not a long one. But the good news is that these toys really are durable enough for your bully to chew on, play with and thoroughly enjoy safely! Does your Ppitbull have a favorite toy? Please drop us a comment and let us know what your bully puppy or adult dog likes to play with! Enos, S., “Pit Bull Myths – Debunked,” American Pit Bull Foundation, 2017. Torres, T., “Pit Bull Facts,” Villalobos Rescue Center, 2018. Coren, S., PhD., DSc, FRSC, “Dog Bite Force: Myths, Misinterpretations and Realities,” Psychology Today, 2010. You should really include the Indestructibone chew toy. It is the absolute best chew toy for heavy chewers.